A deeper understanding of finite element methods, and the development of improved finite element methods, can only be achieved with an appropriate mathematical and numerical assessment of the proposed techniques. The basis of such an assessment rests on identifying whether certain properties are satisfied by the finite element scheme and these properties depend on the framework within which the finite element method has been formulated. In this chapter we first review fundamental concepts of functional analysis, and then present different basic frameworks of variational formulations and finite element discretizations that we will use in the later chapters for shell solutions. For completeness, we prove the stability and convergence properties of the abstract finite element discretizations for each of the frameworks of variational formulations considered. 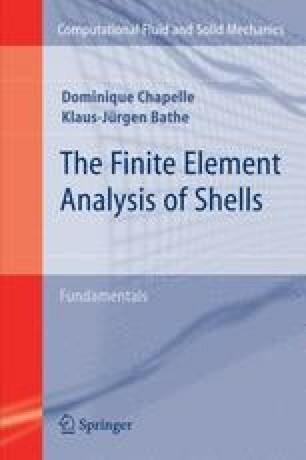 This chapter therefore provides the foundation used for the later assessment of the reliability and effectiveness of shell finite element schemes.